Laminate flooring has taken the DIY world by storm because of its many advantages. It is affordable, quick and easy to install, and long lasting if you buy the correct type for your application. It has recently come to my attention that there is a similar product that is even better – Modern Vinyl Flooring! FINfloor is our go-to when it comes to laminate and vinyl flooring options. Small Scale Engineering has purchased from FINfloor previously for various projects. We were very pleased to see their stand at the Decorex expo in Cape Town this year. We, of course, went to speak to the reps and were rewarded with a sneak peak at their latest product that they were showcasing – Diamond Core Rigid Vinyl Flooring. To be honest, it took me quite some time to figure out the difference between vinyl and laminate flooring.The two products are very similar but if you want something more long-lasting, vinyl flooring is the way to go. Laminate flooring is a layer of a “synthetic wood material” (think Supawood or MDF) layered with resin and topped with the printed design. Vinyl flooring is a little more complex. Wood chips and resin are compressed together; on which the printed design is applied. A further transparent layer is added to protect the board. It is more heat and cold resistant than preceding options and can therefore be used in any climate. There will also be no expansion issues with the flooring sitting in direct sunlight. Most importantly they are safe. Diamond Core vinyl flooring is made without the use of formaldehyde, and has undergone strict international testing. With all these amazing features, Diamond Core Vinyl Flooring is definitely something to consider should you want an amazing flooring option in your house or office. 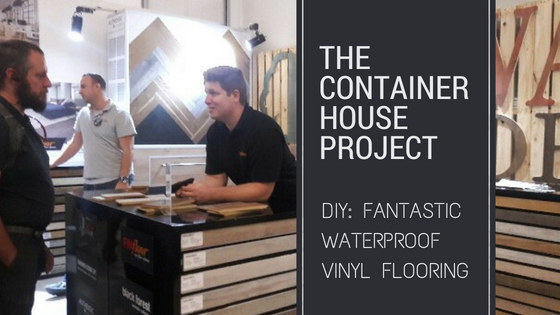 In conclusion, we are hoping to see FINfloor’s Dimaond core vinyl flooring somewhere in our finished shipping container house. It was all I could do not to pick and choose my favourite designs right then. However, flooring companies do change their ranges from time to time to keep up with ever-changing trends, so this is something we would best do closer to fitment date. For more information on the Diamond Core range, please contact FINfloor. They have branches in Durban, Johannesburg, Centurion and sales representatives in Cape Town. Click here for FINfloor’s contact details. I’m glad you’ve worked it out so clearly. Every time a certain family member of mine comes to visit, he looks at the laminate floors, wrinkles his nose, and informs me that at some point I must get some “proper” flooring installed. I’ll keep this blog post handy for when I decide to follow his advice! Oh dear! I’m sure your laminate floors are not that bad! There are definitely various qualities of laminate flooring and if you can afford a better quality one, go for it because it will last longer.